Tony and Grace Pirog chat with featured artist Ineke van Werkhoven; signs of spring can be seen in the sight of assorted flowers surrounding them. Ineke's painting of daffodils now resides in the home of Jane and Paul Stahl. Daffodils hold a special place in the hearts of Jane and her family. Ask her why. Having folks peek in the window is a good sign for any business. Grace's Bear Fever bear welcomes visitors to the shop. Elaine Hardenstine, BASH's valedictorian of the Class of 2006, admires her adopted Bear Fever pal. Elaine stops by Gracefully Framed to visit her adopted Bear Fever bear. When I first met Grace Pirog, I could tell right away how excited she was to be a part of the project. She had so many ideas and pictures in her head. As we discussed the earth tones she was planning on using for her “Dutch bear,” she showed me her inspirations. From magazines, to books, to old pamphlets, Grace had done her research on Dutch culture. I couldn’t wait to see what it looked like. Grace presented the bear to me in her store window, and I laughed. It had a Christmas collar around its neck; it was ready for the holidays. And Mrs. Pirog was ready to start designing. This was one of my favorite visits. I wish I had had my camera! I walked in on Grace sketching designs on her bear. Her palms were smeared with pencil and her eyes were deep in concentration; she looked like the dedicated artist. The first picture was spread out on its back. It was a bird surrounded by flowers, and it was beautiful. I was thrilled when she promised to have some color the following week. I was anxious to come back and see what design she picked next. Blues, greens, reds, and golds! The colors were perfect. Each picture had two coats of color and a black outline. Down the bear’s back, a long vine flowed. It had these brilliant blue flowers- I’ll always remember that blue. 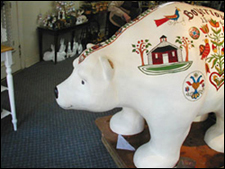 She had written Boyertown in the center of the bear’s side, and she talked of her plans to call the mayor for the town’s founding date. At the time, she was in a lull. She needed more ideas for pictures. To get them, she said, “I just sit and putz around. 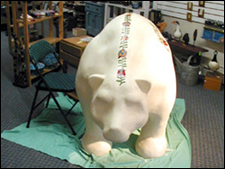 By looking at the bear, ideas just come to me.” I asked Grace how the public responded to her project. She said when they came in the store to look around (she paints all the wooden houses on sale inside! ), they would “ooh and ahh!” Some people would pet it or even talk to it! 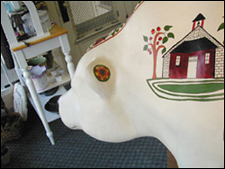 Grace had lots of designs by now, including a school and a church. All she wanted to do was add a couple birds and hexes. Her husband thought it would be nice to write the Dutch words for school and church under the corresponding picture; I agreed! And, sure enough, Grace had called the mayor. 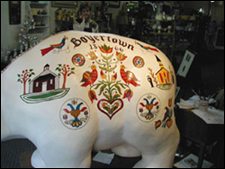 Boyertown’s founding date, 1866, was proudly displayed on the bear’s side. The bear was almost done! All Grace needed was the finishing seal, and it was ready to present. 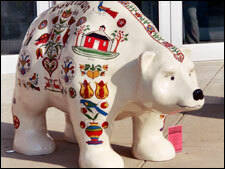 Along with more color, the bear received a face since I had seen it last. She was fluttering her eyelids and smirking, and her ears were filled with flowers. I loved it! Her employee agreed; she kept smiling and chatting about it. Grace had found Dutch words for her bear, like scod, for school. 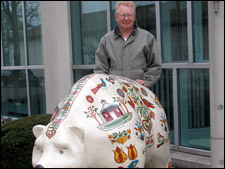 And best of all, the lady bear had been named Bearsnickel. How appropriate! Boyertown’s little Dutch lady was really ready to show off!